Join us for our first ever friend-raiser to build people, not prisons! Enjoy great company, tasty snacks, beer and wine, and a special encore spoken word performance of "Build People, Not Prisons" by Playing for Others Teens! Join us and help build people, not prisons. ONLINE TICKET SALES ARE NOW CLOSED, BUT TICKETS MAY PURCHASED AT THE DOOR FOR $25 STARTING AT 5PM. The purpose of this friend-raiser is to garner community support and raise awareness about the needs of people reentering the Charlotte community from jail or prison, and the needs of Charlotte children experiencing parental incarceration. This evening will feature a special guest performance by Playing For Others teens of their spoken word piece, "Build People, Not Prisons" and the premier of CCT's newest video, developed by Basic Cable. You'll also enjoy live music, appetizers from Ink N Ivy, beer and wine. Early bird tickets may be purchased before March 9th for $20. Regularly priced tickets are $25. Tickets include admission, appetizers, desserts, and drinks. BREAKING NEWS: OPEN BEER AND WINE BAR - Originally admission included 1 free drink, but now, thanks to generous donors, enjoy unlimited free drinks including beer, wine, kombucha, sodas, and water. All proceeds from the event will benefit CCT's three core programs serving Charlotteans impacted by incarceration. 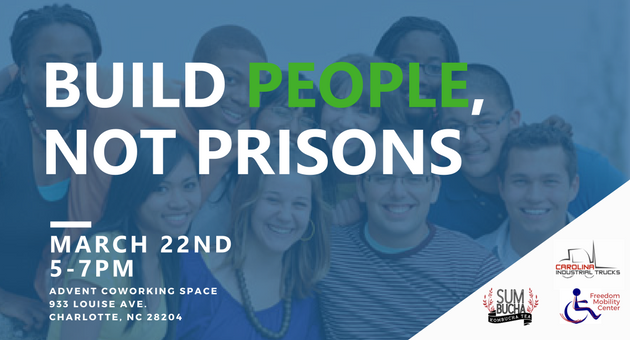 Join us to mingle, learn, and build people, not prisons.